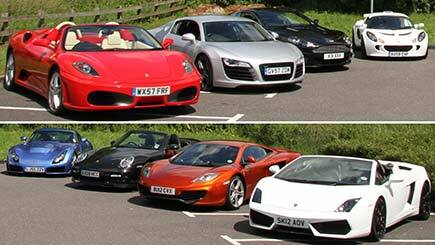 Experience the ultimate in on road supercar driving with this great adventure from North London. During the day, split into teams of two and drive a total of eight iconic supercars including a TVR, Porsche, Lamborghini, Maserati, McLaren, Aston Martin and two different models of Ferrari. On arrival, enjoy breakfast before getting some basic instruction and a safety briefing, then the fun really starts! Get on the road and follow a specially planned course, taking turns to be passenger and driver. At each change-over, a professional instructor is on-hand to offer advice and answer any questions to ensure you get the most from each vehicle. A two-course pub lunch, refreshments, photo opportunities, a baseball cap and a de-brief are also included. Weekdays and weekend dates from March - October. At least one date per month. Drivers 30 - 65 years only. Min height 5'2'', max 6'5''. Max weight 18 stone. Full manual driving licence, held for a minimum of two years, required. Max six points on licence, with no drink or dangerous driving convictions. Starts at 8.30am and ends around 5.30pm, including breakfast, lunch, refreshments, a de-brief and a total of 75 miles hands-on driving time (six hours in the car, sharing driving). A maximum of 16 participants take part on the day, with no more than two participants per car. This experience is for one person, but driving time is shared between two participants.